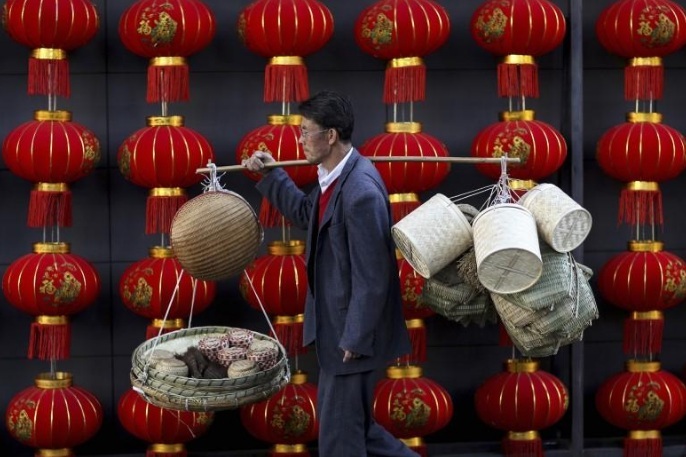 FILE PHOTO: A basket vendor walks past red lanterns serving as decorations to celebrate the new year outside a shopping mall in Kunming, Yunnan province January 6, 2015. BEIJING - Business activity in China’s services sector grew at its slowest pace in 21 months in September as the pace of new business cooled, a private survey showed. The survey was in sharp contrast to an official gauge of the non-manufacturing sector that showed the services sector expanded at the fastest clip since 2014 in September, blurring the picture on how a key part of the economy is performing. The Caixin/Markit services purchasing managers’ index (PMI) fell to 50.6 in September, the lowest reading since December 2015 and one of the weakest since the survey began in 2005. A reading above 50 indicates growth, and any lower than that signals contraction. The index had hit a three month high of 52.7 in August. New business in September grew at a slower pace than in the previous month but was still relatively solid with a reading a 52.0, while backlogs of work declined for the first time in five months and hiring slowed. Input price inflation for services firms picked up slightly from August but was just barely in expansion territory, while prices charged also rose only marginally after falling in August. A separate Caixin/Markit survey last week also showed growth in the manufacturing sector slowed in September, but factory activity still grew faster than services. Caixin’s composite manufacturing and services PMI, also released on Monday, fell to 51.4 in September from 52.4 in August and was the lowest since June. “The Chinese economy generally held up well in the third quarter,” Zhengsheng Zhong, director of macroeconomic analysis at CEBM Group, said in a note accompanying the data release. Official measures on both the manufacturing and services industries for September showed growth in both sectors at multi-year highs. The private survey covers fewer companies and focuses more on small and medium-sized firms which have struggled more than their larger, state-owned peers that enjoy easier access to cheap credit. China’s central bank said on Sept. 30 it cut the amount of cash that some banks must hold as reserves for the first time since February 2016 in a bid to encourage more lending to smaller firms and energize the lackluster private sector. Economic data to be released over the next few weeks is expected to show economic growth remains robust and resilient despite tighter monetary policy, welcome news for leadership ahead of a twice-a-decade party congress that kicks off on Oct. 18. China’s economy grew by a stronger-than-forecast 6.9 percent in the first half of the year and is expected to easily beat the government’s full-year target of around 6.5 percent, even if growth fades a bit in coming months. Business activity in China’s services sector grew at its slowest pace in 21 months in September as the pace of new business cooled, a private survey showed.